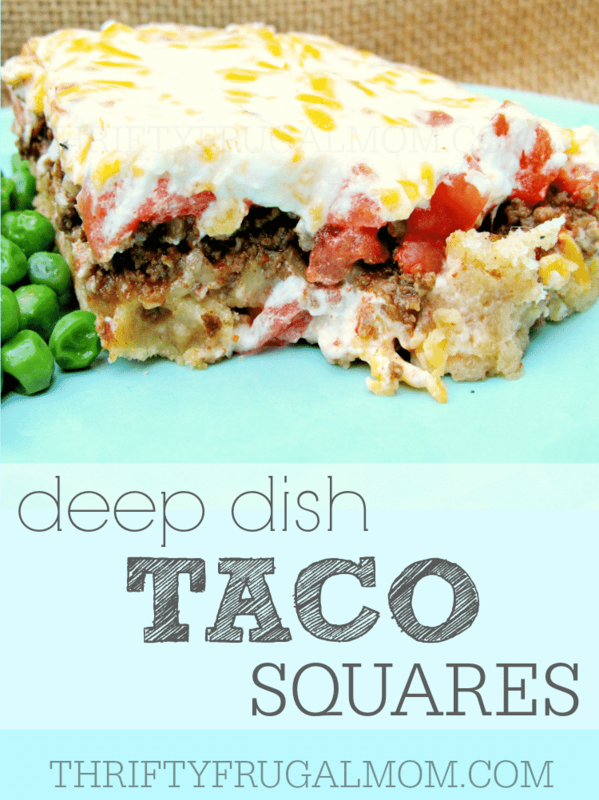 This easy recipe combines layers of sour cream, cheese, tomatoes and ground beef on top of a tasty crust for a delicious kid friendly dinner! While our family doesn’t mind tomato soup and recipes that use cooked tomatoes, oddly enough, none of us are big fans of tomatoes when they are fresh. The thing is, while we don’t have much room for a garden here in the city, I love planting a couple of tomato plants each year because they usually grow well and are easy to take care of. So every year, I find myself looking for new ways to use up the random tomatoes that we harvest. Several years ago I had a couple of fresh tomatoes that needed to be used up before they spoiled. As I was flipping through a small church cookbook, I came across this Deep Dish Taco Squares recipe and decided to try it. I was a bit worried that the tomatoes would be too obvious for the kids, but I made it and we all loved it! In fact, it was so tasty that several weeks later when I got hungry for it again but realized that I didn’t have any fresh tomatoes, I improvised and made it using diced canned tomatoes. It ended up working really well and is my fall back method when I simply don’t have any fresh ones on hand. This recipe is one of those comfort food sort of dishes….hearty, creamy and just plain delicious. An added bonus is that it’s always a hit with our children too and I love that it helps get them eating more tomatoes. Score! Mix sour cream, mayonnaise, cheese and garlic powder. Set aside. Top with cooked ground beef then the tomatoes, then the sour cream mixture. Sprinkle with paprika if desired. ** 1 (15 oz.) can of diced tomatoes, drained (learn how to make your own! ) can be subbed for the tomatoes- just be sure to drain it really well! Yum!!! You posted one of our favorite recipes! I haven't made it for awhile, this reminded me that I should once again. We also like it with salsa in place of the fresh tomatoes. So delicious! Oh, I can totally see salsa working in this! Great idea! Oooh, yum! I have been really into Mexican style food lately, and this looks great! it's been rainy here all week and I could use this type of comfort meal today! looks wonderful! This looks really good! We love casseroles, so we'll have to try it. I have a friend who hates fresh tomatoes but loves them canned, so your family's tastes were familiar to me. :) I never have understood how my friend can't enjoy a fresh, ripe, summer tomato (sliced and sprinkled with salt or balsamic), but we all have different tastes! :) Its good to have a recipe like this one that can use fresh or canned tomatoes. 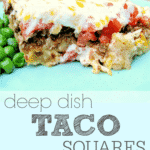 Your taco squares look delicious! Oh this is super creative! I love taco nights!! Hi! New reader from the Learn to Blog FB page. I love anything and everything Mexican food related so I'm excited to try this. Definitely pinning! Thanks for sharing. Mexican's always a hit around here, and it's great you can use different types of tomatoes without issues! I hope you can stop on by and share this or any other recipe with us on Five Friday Finds! Yes, I'm one of those cooks that is always tweaking recipes to work with what I have on hand, so I slowly figure out things like the fresh or canned working well! I think even my picky family would like this... Thank you for sharing! It's definitely one of those recipes that is typically a winner with everyone, Jerusha! Looks so good! I'm adding this to our weekly menu plan. Think I'll serve with a side of black beans and rice - but that's what we love with Mexican foods. Well, I'm so honored that this is making it on the weekly menu plan! :) I hope you all enjoy it as much as we do. Making this tonight, and I want to be sure. You do not add taco seasoning or anything to the ground beef, just brown it with onions?